Upgrades to a crawlspace often include installation of a moisture barrier and insulation, as is the case with this one in Lakewood, Colorado. A GBA reader in Climate Zone 4A is trying to sort out the insulation details for the crawlspace under his home. Emerson has moved into a house in Climate Zone 4A, a region where humidity can be relatively high. As Emerson explains in a Q&A post, the crawlspace beneath part of the house has been closed to the outside, and now the question is how to insulate the space to help keep the house comfortable. 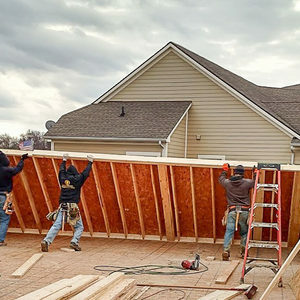 Emerson refers to an article on this topic posted by Carl Seville in 2011, and in particular to a comment from Ted Clifton who advocates the addition of insulation in the floor above the crawlspace as well as walls, and possibly the crawlspace floors. Clifton’s approach is aimed at keeping warm, humid air away from cold surfaces to prevent condensation and the moisture problems that would follow. Emerson has added a polyethylene vapor barrier over the concrete floor, and 2 inches of rigid foam insulation on the walls. 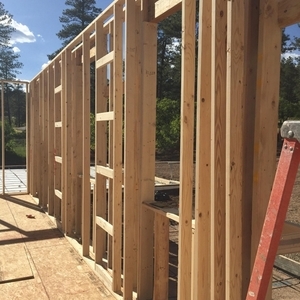 In considering Clifton’s recommendations, Emerson is thinking of adding R-38 of batt insulation between the 2×10 floor joists above the crawlspace. Stone walls (R-3) on the first floor help make Emerson’s bedroom cold. How should Emerson detail the crawlspace? That’s the question for this Q&A Spotlight. To Michael Maines, the safest option is to fully condition the crawlspace, which would include a layer of insulation on the floor if possible. 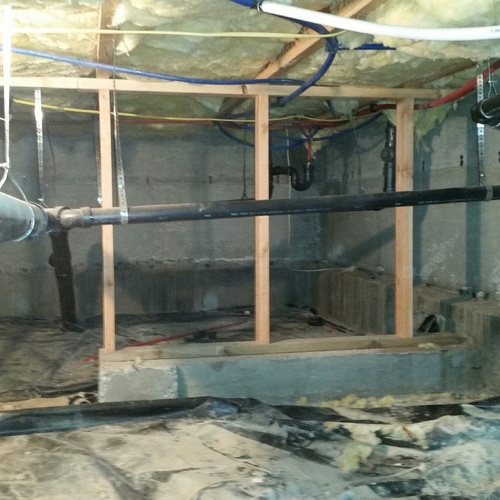 “I’ve detailed a couple of similar crawlspaces recently, using a Fantech FR 100 inline fan and off-the-shelf ducting to push conditioned air from the main level into the far reaches of the crawlspace, which can then return to the basement or living area via openings similar to yours,” Maines writes. Maine says the International Residential Code includes specific requirements for ventilating crawlspaces continuously. But inspectors he’s worked with have allowed the use of a timer on the fan to produce the equivalent amount of ventilation air. In the past, Maines adds, he assumed air in a crawlspace under an addition would circulate on its own, but he recognizes now it probably doesn’t. By pushing warm air into the crawlspace, the air temperature goes up as the air circulates. Kevin Spellman refers to a report on closed crawlspaces in the southeastern U.S. advocating the use of small dehumidifiers or a small amount of HVAC supply air to control moisture. 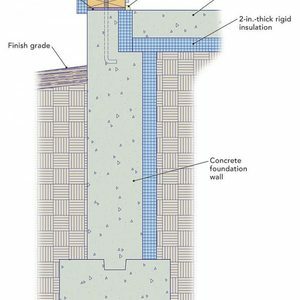 Jon R suggests air sealing the bedroom floor probably would do more to keep the floor warm than adding insulation between the joists. 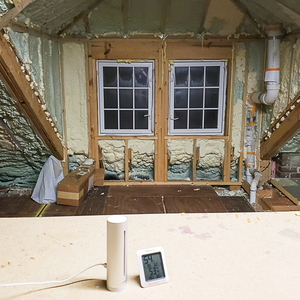 “I don’t know just how cool the crawlspace is, but insulation might warm the floor by 2°F,” he says, adding that the difference between using R-30 and R-38 batts would probably be insignificant. He points out that Clifton’s comments were about foam insulation and moisture, not cold-season comfort or the use of fiberglass batts. 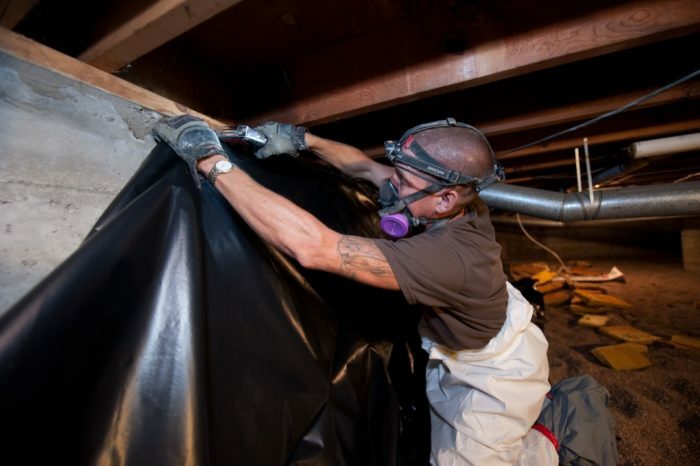 To air-seal the crawlspace, he suggests that Emerson attach foil-faced polyisocyanurate insulation under the floor joists and seal the joints with 3M 8067 tape. That, he says, would provide air sealing and insulation in a single step. Emerson’s plan was to use kraft-faced fiberglass batts to insulate the bedroom floor above the crawlspace. But, as GBA Editor Martin Holladay points out, kraft paper is asphalt-impregnated and is flammable. Holladay, however, is no fan of fiberglass batts in a crawlspace ceiling because they’re hard to keep in place. Over time, he says, they have a tendency to sag and fall to the floor. Many years ago, when first working at Building Science Corporation, Joe Lstiburek said that we should think of crawlspaces as basements for short people. Perhaps not all that politically correct, perhaps, but the comments gets right to the point. Any crawlspace should be either completely inside or completely outside the conditioned space of the building. That means insulate and air seal at the perimeter of the crawl — with no vents — or insulate and air seal at the ceiling of the crawl, with perimeter wall vents per code. It does not matter which option you choose for your crawlspace. 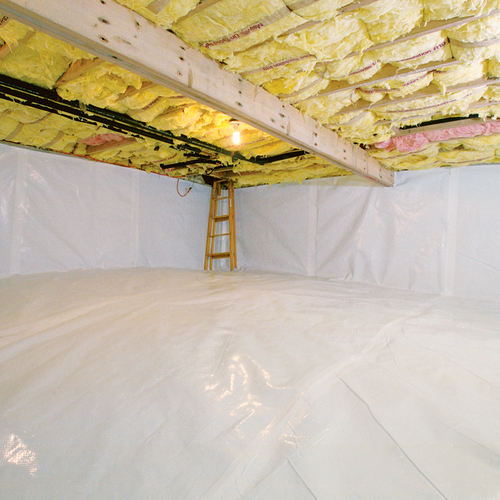 All crawlspaces need a continuous and sealed moisture barrier. That’s typically at least a 6-mil layer of sheet polyethylene, but a better practice is to use a more durable and heavier (10-mil) sheet, or even cross-linked plastic sheet. 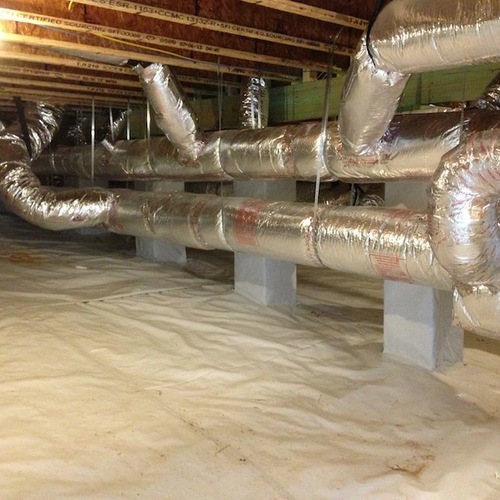 Does the unvented crawlspace need to be fully conditioned? No more or no less than we condition our basements, in my opinion. Any space inside the air and thermal control layers should see at least incidental space conditioning — some space heating and as indicated, dehumidification — just like many of our basements. If there are mechanical system components — ducts, air handlers, heating and cooling units — in the crawlspace, you are likely to get enough incidental conditioning to keep things from becoming stale, musty, or developing an air quality problem. Do we have moisture problems in basements that are not fully conditioned? Sure, and the same is true for crawlspaces; they may require more dedicated and intentional conditioning, including dehumidification. My friend and code-guru for Minnesota, Peter Kulczyk, tells me that in Minnesota the code requires a single return and supply for unfinished basements; that seems reasonable for unvented crawlspaces. In my experience, it is much easier to achieve continuous air and thermal layers at the perimeter walls of the crawlspace than it is on the ceiling. The number and nature of penetrations — wiring and plumbing mainly — makes it inordinately difficult to seal the space, especially if it is really shy on height. Although this doesn’t apply here, the other issue for vented crawlspaces in my experience is just how little air movement or exchange they actually get. The code requirement of 1/150 (1 square foot of vent area per 150 square feet of crawlspace floor area) is not based on building science principles or research (see William Rose’s book, Moisture in Buildings, Chapter 5, page 160) and in my experience, rarely if ever provides enough air exchange in crawlspaces to be considered a true ventilation system. I have measured no air movement in code-compliant vented crawlspaces when outside the wind was steadily blowing at more than 20 miles per hour. One other note: Crawlspaces that connect through a limited opening to a full basement do not take care of themselves. That opening does not typically provide any driving force for significant air exchange with the basement. And finally a shout-out to Jon R for comment #7. Certainly a continuous air control layer in this space is as important as, if not more important than, the continuity of the thermal control layer. Who is Jon R. ? Most of the people quoted in articles in our "Q&A Spotlight" series (including Jon R.) are GBA readers who posted comments in the thread under discussion. It's important to get context by clicking on the first green link. Does a Crawl Space Make Sense?